thinking and thoughtlessness | sahaj philosophy? This year for me, the “special discovery” was our new Indian vocal teacher, Koushik. Replacing Ranjan who was teaching Indian vocal classes the last few years was not an easy task, he had quite a pair of shoes to fill. And yet he did that so effortlessly and graciously. Brilliant and yet so easy to be with, funny and yet never offensive, with the singing that would create such deep feelings of joy, and awe, and peaceful satisfaction. When he would sing, he would generate so much appreciation of the subtleties of Indian Classical music, and yet make it so easy to hear and so enjoyable, – you just din’t want him to stop. And so, with this season being over, and another Canajoharie summer behind us, there is gratitude, and also the anticipation of future meetings, of the times we will still spend together in the future. Love these kinds of feelings. 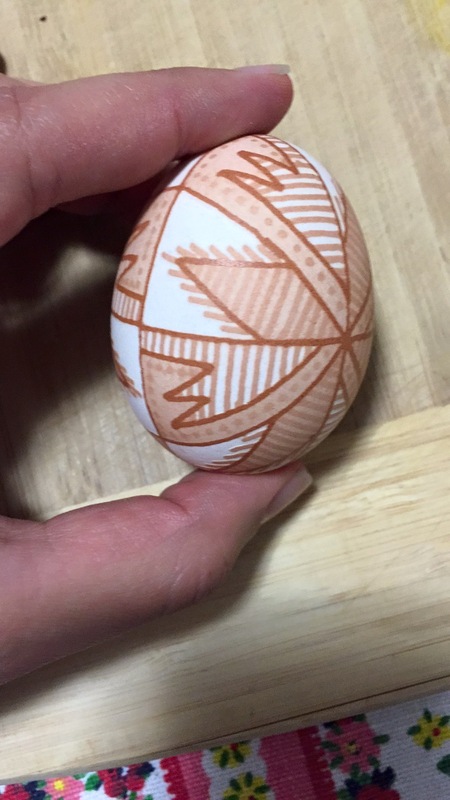 This year I taught an “Egg Batik” course for one week. I had only three students, so it was a very cosy and comfortable work space. It was a great experience, very inspiring, and also very useful for the future. I refuse to teach “one egg pattern suits all”, and so for each class I have prepared for my students a variety of (100% traditional) patterns within the same basic framework to choose from. 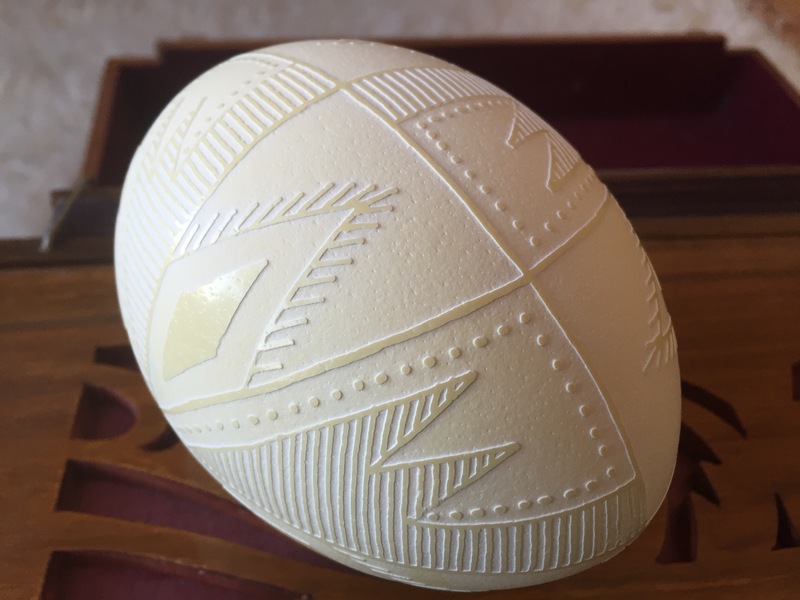 It was great, because I was amazed to see how different people chose very different styles of egg patterns, and so it just confirmed for me that it is worth putting in extra work to be able to provide some variety. In the future, I will probably reduce the number of patterns to choose from (instead of almost 20 per class, it will probably be enough to have about 8). It was also great to see after two or three days the students going off into the books, looking for other patterns, or for inspirations for their own eggs. Here’s a video about several classes, mine is the first clip, starts at about 50 sec. Today is the 260th birthday of William Blake, and on this special occasion, I wrote another reflection inspired by his illustrations of the book of Job. It is about the lessons on surrender. Surrender is one of the fundamental concepts of the meditative practice, and at the same time it is one of the most difficult concepts to understand, to accept and to enact in life. We often struggle with it, or even against it, again and again it puts us to test, and sometimes we pass it, while other times we fail. Surrender has to do with giving up something of our own and instead accepting the conditions of someone else. When we talk of meditation, or of spirituality, we often say that we need to surrender, and that calls for two questions. The first one: what it is that we need to surrender? The second one: when we surrendered, then to whom or to what? The meditation I practice is about growth. It is about developing your capacities, about trying to become the best of what you can possibly be individually, and, as much as possible, improving your community and your society. In the process, we often develop a subtle ego, a feeling of moral or spiritual superiority, a false arrogance in believing that we know best how things should be done and what is the right thing to do, what is just and who deserves what. The first of our questions then would be relatively easy to answer (though not very easy to enact): we need to surrender, often, and repeatedly, all kinds of false ideas, false identities, false presumptions and habits, we have to try to gradually shed everything that prevents us from eventually manifesting our truest and purest Self and fully identifying with that Self. Now, let’s talk about the Book of Job. It is one of the most puzzling stories from the Old Testament, perhaps because it is about surrender, perhaps also because it challenges one of the allies of our subtle ego, – a sort of retributive justice we often use to explain misfortunes (usually the ones that happen to others). It is a belief that suffering must always be the punishment for sin (and that whoever suffers must deserve it), and, correspondingly, that health, wealth, and happiness must always reward “goodness” and “righteousness”. I’ve been inspired to ponder about the story of Job and to write this post (asecond one already), because a while ago I came across amazing illustrations by William Blake. He made two sets of watercolours and one set of engraved prints. Luckily for us, they are nicely collected and available in the public domain here [https://en.wikipedia.org/wiki/William_Blake%27s_Illustrations_of_the_Book_of_Job], and so I invite you to explore these illustrations also while you are reading the post. It means a lot, that of all the themes of the Old Testament, Blake worked so much on the story of Job. So, here is the story of Job. Job is a righteous man, well-respected, just and pious. God has a discussion with Satan about Job’s devotion to God, and Satan claims that Job is only pious because he is doing well, he has everything one might want in life, but were he to be deprived of his wellbeing, he would not remain faithful to God. God accepts the challenge and allows Satan to take away everything that Job has: his wealth, his children, and eventually his health, to see that Job will remain pious even when the blessings he is enjoying are stripped away from him. At first Job stays strong, but eventually, as things get worse and worse, and also as Job’s friends begin to say that Job must have committed some sins, to be so badly punished by God, Job loses his calm. He insists that he has not done anything wrong, he doesn’t know why God is punishing him, and eventually he feels that to die would be better than to suffer so miserably. It seems, justice is a huge issue for Job, he feels that his suffering is not just, and so he calls on God in despair. This is why the book of Job is so interesting, so challenging and so philosophical at the same time. It contrasts our human sense of justice with the divine justice, our human character with divine qualities, our limited human capacities with the infinite nature of God. Then something happens. The Lord answers Job from the whirlwind. The response of God is very interesting, for in beautiful details it tells Job that while Job knows very little it is the God who is present and is working though all aspects of nature, all elements, the whole creation. It doesn’t directly respond to Job’s plea, but it brings his existence into perspective. Job recognizes his own caliber, and then God restores him back into his wellbeing, gives him back his wealth and family, his respected position, but, most of all, his solid faith in God. Now, what are the lessons to learn from the Book of Job with regard to a meditateve practice? I remember, one of the things I still had in my teenage years, was the feeling of closeness with God, the feeling of God’s presence, the sense that I could talk to God. It was not just the belief that God existed, but also the feeling of trust that God takes care of things, and everything will eventually work out. As I was growing up, I lost this feeling, became close to being an agnostic, and that has dramatically changed the emotional quality of my life. One of the first things I rediscovered once I settled into the practice of meditation, was that sense of emotional security, the feeling that things are happening the way they supposed to happen, and everything will be alright in the end. It isn’t just a belief, rather, it is a tangible feeling of the flow of energy that is healing, calming and comforting. Something that occurred to me recently, also with the help of the story of Job, that to be able to “surrender”, we have to have at least some sense of who or what it is that we are surrendering to. We need to have and to sustain the experience of some Power that “runs” the universe, in all those beautifully detailed aspects that we read about in God’s response to Job. We need to trust that Power, whether we call it Divine, or Nature, or Universe, that it cares and takes care of everything, including us. This experience of the established connection with the Energy of the Universe is what ultimately sustains us through the challenges that life might bring, and it is the condition of us remaining balanced within and stable, even when the outside conditions are turbulent. It is not enough to rationalize and to understand, it has to be experienced, and the experience has to be established, as Job says (quoted by Blake): “I have heard thee with the hearing of the Ear but now my Eye seeth thee”. It was not enough to “hear” God for Job to maintain his sense of what God was, he had to actually “see” God, and that has restored his connection which he was losing when challenged with suffering. This is why we keep insisting in our meditation classes, that no matter how much you read, and how much you know, you will only progress on this path through daily practice of meditation, for that is the only way to have an actual real experience of being connected to the Energy, and to establish that experience within you. Something that often came up in the old Christian and anti-Christian arguments about the existence and nature of God with regard to the problem of evil, was the whole sense of bafflement, that Job also experiences, that how can the benevolent and powerful God allow for the “suffering of the innocent” in the world? A way to approach the issue from a slightly different angle in this: in the story of Job, who actually has the need for that drama of loss and suffering to take place? Does God need to test Job through suffering? Obviously, not. When God appears to Job and responds to him, Job’s suffering is never addressed, neither is the notion of justice, that is not what is at stake here. It is Job himself, who needs to go through this experience, firstly to be able to see where he is at, and how strong is his state, how pure and how true is his understanding of himself, how adequate is his understanding of and trust in God. Secondly, through this experience Job can learn, he can grow a little further, he can shed that (already very thin, after all he is a good and pious man) layer of subtle ego and self-righteousness, which, when tested with loss, pain and nightmares, makes him think, that he is the one who knows what is just, that he can make a judgement, and he is right to be disturbed when that judgement is clashing with reality, thus bringing God into question. So perhaps we can try out this approach. When things are not going according to our plan and our preference, we can take on a challenge and use the unpleasant (disturbing or even painful) situation to test ourselves, our state, our attitudes, our reactions, unlimitedly, the level of out surrender. We don’t need to go through suffering as horrible and painful as that of Job, regular small or bigger challenges of our lives will do. It’s that time of year again when we do summaries and New Year’s resolutions. This year some predictable progress has been made both on dyss and on eggs – my first experiments with natural dyes were interesting, you can see a few posts about them here: https://goldenwomb.wordpress.com. Music is where things took quite an unexpected (even for me, or, perhaps, especially for me) turn. Here’s what happened. In our by now annual arts camp in Canajoharie this year I was planning to take it easier and was hoping to get some writing also done on the side. So I signed up for two of Ranjan’s classes – vocal and harmonium, and thought that was going to be it. But then, sometime towards the end of the first week I happened to witness Shakthi, the flute teacher, jamming with a couple of his advanced students, and it sounded so good, that I felt for the first time in my life: I’ve got to try this flute thing, don’t know why and what for, but I’ve got to give it a chance. So I did, and it filled up of my music-allocated time plus some more :). So, I’ve been practicing for 4 months now, still at the stage of playing “scales” and exercises, which would be quite boring, I must say, if something else was not also happening at the same time. I sit there in our meditation room (we have a meditation room), playing notes for an hour or so, and that simple and otherwise boring “work-out” not only settles me completely into myself, and washes away many of the superficial concerns, but also manages to dig under and turn over some rocks here and there that I didn’t even know I was carrying. That’s pretty powerful, and even though I have heard about this before, it’s very different when you actually experience it yourself. 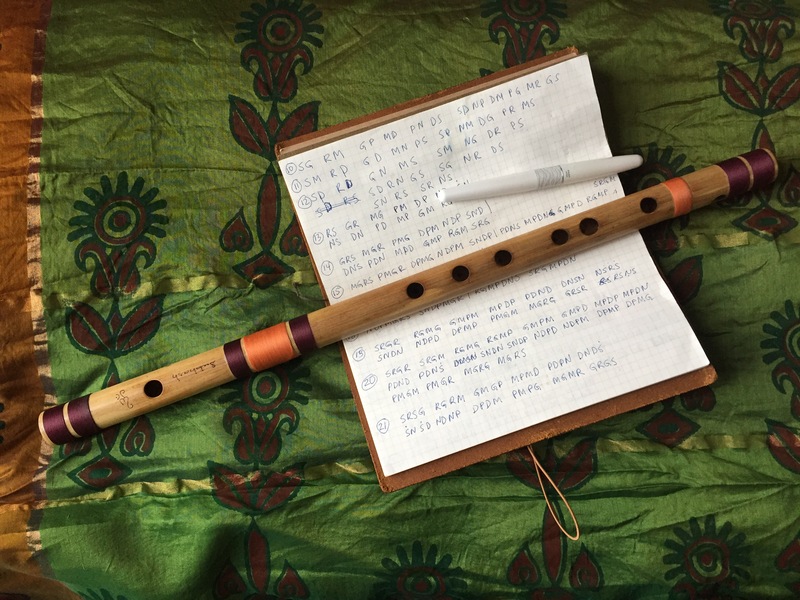 They say flute is the closest there is to singing (though, I’ve heard that said about sarangi also), but it feels extremely different to me, at least at this beginner stage. While in using voice you are out there fully exposed, I find that flute gives you some distance, the sound, perhaps because of being mediated by the instrument, is heard as if from a side, and it’s true, you hear it in a very different way than you hear your own voice. For me that is a very different experience, both interesting and empowering in a very new way. So, it seems, next year will be dedicated to flute experiments, and otherwise my work schedule in the first few months will be brutal, but there there will be two weeks of India in the second half of February, just to make the brutality of work bearable, and then we will see what the summer brings. So, I have a tradition here in this blog, once a year in the winter to record and post a folk song my grandma used to sing. This one is number three, and might be the last one. While I do know a few more dozen of Ukrainian carols and other winter songs, these three are the only ones that were quite different from the “common” ones. Well, come next winter we’ll see. So these were the songs that would be sung on the eve before Epiphany for all children and young people, pretty much whoever is not married yet, and for most of them the motive would have something to do with a problem or a situation that is not resolved by the efforts of your mother and father, and the siblings, until your beloved arrives, and then everything will work out. As I mentioned last year, mine was about me sitting in the apple tree and refusing to give an apple to anyone (since apparently I only have one, duh, it’s January), util my beloved comes and I give it to him. Ironically, of all my girl-cousins I’m the only one still “sitting in the tree”, so maybe I can blame the song for that, maybe if I got a better song (there were options of washing handkerchiefs on ice or watching the herd of oxen, instead of sitting in the tree, doing nothing, and being stingy), life would be different? Joking, of course. The boy went into the mountains to fight. (Chorus: )He is young himself, and his horse is black. He was attacked by three robbers (or bandits). They ask him: who is your father? My father is the bright Moon. They ask him: who is your mother? My mother is the star in the sky. They ask him: who is your beloved? My beloved is the sabre on my side. The song seems somewhat unfinished, and I remember asking: so what happened next? I got an answer that was overly pacifist and not particularly logical: oh, they let him go. The logical answer, that would follow the epic canons would be: he pulled his sabre out and killed them all, so that they could not trouble anyone any more. I’m not sure whether that particular pacifying answer was tailored to me, since I had periods in my childhood when I would not leave home without carrying all of the toy weapons I had. When I was five and a half in the kindergarten, apparently I tried to strangle a little rascal who stole my markers that were brought the other night by Saint Nicholas, he was lucky that the teacher heard his squeaking somewhere in the corner where I was finishing him off, and saved him. And there was a period when I was not want fond of drawing anything but the tanks on the battle fields. So perhaps that answer was meant to curb my already overly-worrier-like nature. Or maybe it was the self-preservation on the level of the whole family, and the whole nation also – after two wars, a house burned for political reasons, moving into Soviet territory, the exiles of family members, later participation in underground publishing of censored literature, and the typewriter that had to buried in the ground, being expelled from universities also for political reasons, and being regularly called in for KGB interrogations, that’s just a fraction of what my grandparents and parents had to live through, it would probably make you want to lay low and avoid confrontation. As a nation, we are just now learning, that sometimes you have to stand up and fight, because evil has to be fought and the evil ones have to be killed. We have avoided it for very long, we have repressed it, and indulged in delusions about “brotherly love”, which still surface from time to time. But we are becoming stronger, hopefully we will also remain human through this fight. What remains is to wish all the warriors on all fronts, that their weapons are reliable, and that they are blessed and protected by the the sun, the mood, and the stars. Це тут третя і мабуть остання пісня різдвяно-йорданного циклу з серії “бабця співала”. Люблю її, бо вона інша ніж решта щедрівок, особлива. Серед всіх тих всіх, що бабця нам, тобто внукам, щедрувала, ця – єдина не тематизує очікування женячки. Вона, звичайно, якась трохи ніби незакінчена, і я пам’ятаю як в дитинстві питала: і що далі було? Мені відповідали пацифічно і нелогічно: ну, що було, відпустили його певно, не хотіли з ним воювати. Не знаю, чи така відповідь була відображенням тодішнього психологічного стану – родинної історії двох воєн, спаленої хати на Лемківщині, переїзду в союз, вивезень родичів, потім самвидавів і закопаних друкарських машинок, вигнань з університету, постійних викликів в КГБ… Чи може може то була корекційна відповідь для мене особисто – в мене були такі періоди, що я виходила з дому не інакше як обвішана всіма своїми іграшковими зброями одночасно. В п’ять з половиною років мало не задушила якогось малолітнього рагуля, який вкрав в мене фломастери, що їх мені щойно приніс святий Миколай (добре що вихователька в садку почула його млявий писк десь в кутку, де я з ним розправлялася, і врятувала). Ну і малювати не хотіла нічого крім танчиків на полі битви. Крім того я могла легко ляпнути щось таке, що не можна було, і від чого потім могли би бути неприємності. Очевидно, що набагато логічнішою відповіддю на моє питання про закінчення історії було б: витяг шабельку, і порубав розбійників на смерть, щоб вони більше ні на кого не нападали. Здається, ми нарешті починаємо вчитися жити цією логікою на рівні нації, хоч періодично ще досі проскакують слюні “примирення”, ну але це не дивно, бо це навмисне спродуковані і запущені мислевіруси. Залишається побажати нашим воїнам на всіх фронтах надійної зброї, і хай їх благословлять своєю світлою увагою сонце, місяць і зорі. Минулорічну щедрівку можна послухати тут: msvarnyk.wordpress.com/2015/01/20/uk…-winter-song/ або там само, де і цю – на саундклауді. Two days ago I got in mail a whole bunch of natural dyes that are normally used for fibres or fabrics (wool, silk, cotton), and I’m dying to try out dyeing eggs with them (did you like the pun, did you like the pun???). But then, on the other hand, there is the Damocles’ sword of the diss hanging over me, and if I dive into eggs, it’s never going to be finished, because eggs are so easy and fun, in fact, this is why I didn’t do any eggs last Easter season (but did sneak in two just before Christmas, because I wanted to make a gift). I wonder whether this will actually work or not :). But I think the plan has a great potential. I’ll probably also create a separate blog just to document my egg experiments. Here are a chicken and a rhea egg I made two weeks ago, and did not show yet. 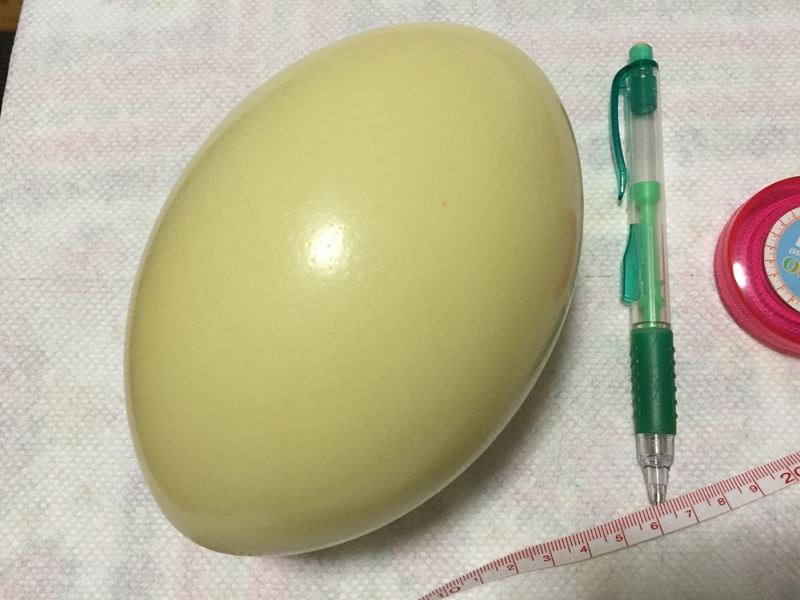 The chicken (first photo) was the practice run on a brown egg for the rhea – the big pale yellow (second and third photo), hence almost the same pattern in both. The pattern on the chicken is almost 100% traditional (except the colors and colouring pattern), and in the rhea was slightly adjusted. Another resolution is to keep up the music – I’ve gotten a good amount of practice (actually better than anything I ever managed to do on my own without any “group projects” in a long time, or maybe ever) from mid September till the beginning of December. But next three months my work schedule is going to interfere a lot with the “morning practice” I had in the fall, so I wonder how that will work out. Add to that the double workload (factually it will probably be even more than double) I have this term compared to the last term, and another lunchtime meditation program in the new company, and the conclusion is this: unless I only do these 5 things (work, diss, meditation, eggs, music) over the next three months, and absolutely no other distractions or side-projects, something will have to give, and since I can’t cut the necessary stuff (work, dyss and meditation programs), I would have to cut the fun and inspiring stuff (eggs and music).